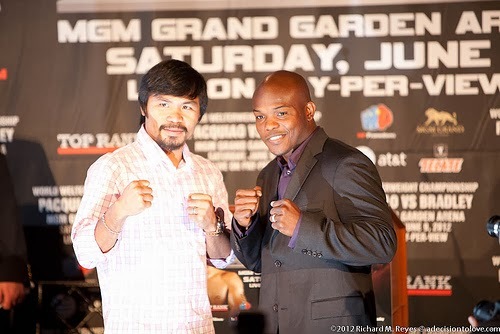 Source: Manny Pacquiao vs. Timothy Bradley Rematch on April 12, 2014 - Balita Boss! The next opponent for Filipino boxing superstar Manny Pacquiao is still undecided but according to Ben Thompson of FightHype.com a source “with knowledge of Pacquiao’s preference” says that Manny has decided to have a rematch with Timothy Bradley in his next fight on April 12, 2014 at the MGM Grand in Las Vegas. “They’re going with Tim. Neither Bradley or Provodnikov are a big draw, but with Bradley, they can at least hang their hat on the fact that there’s history between the two fighters. The controversy of their first fight makes it a lot easier to sell than a fight with the Russian kid,” according to the source. Pacquiao lost to Bradley last June 2012 via controversial split decision, a match many felt Manny won. With a Pacquiao-Bradley rematch, Bradley can prove that he really won the fight with a convincing rematch win. For Pacquiao, he can redeem that lost and can prove also that he’s back to his old form and still had the right to fight Floyd Mayweather Jr.
After defeating Pacquiao, the unbeaten 30-year-old went on to win two more fights against Russian Ruslan Provodnikov and Juan Manuel Marquez. Provodnikov is being considered as a possible opponent of Manny. Marquez knocked Pacquiao out cold in their fourth showdown in December 2012. Pacquiao made a successful comeback to the ring after defeating Brandon Rios last November and win his first fight in two years.